Roy Benson was born December 7, 1906, in Concord, New Hampshire, exactly thirty-five years before the infamous Japanese attack on Pearl Harbor. He graduated from the U.S. Naval Academy at Annapolis, Class of 1929. Lt. Cdr. 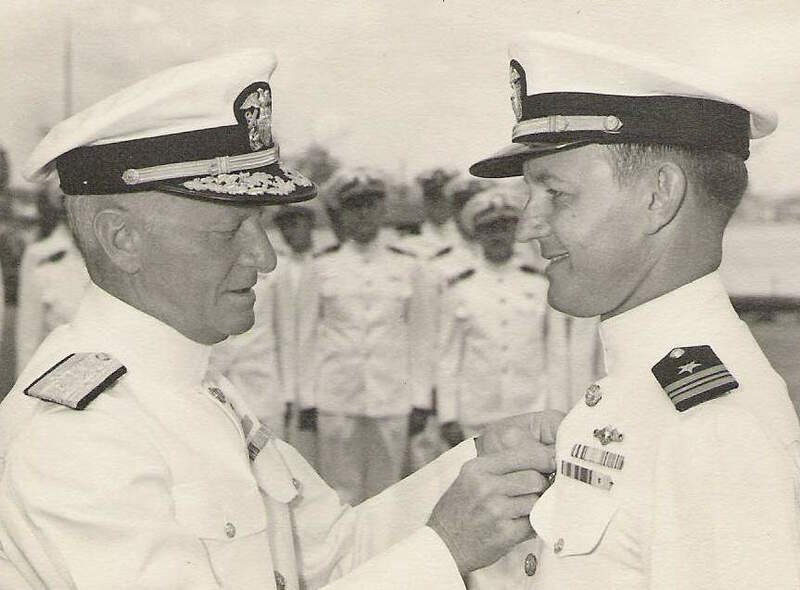 Roy S. Benson, commanding USS Trigger (SS-237), receives a second Navy Cross from Admiral Chester W. Nimitz. USN photo courtesy of Rick Connole. Benson served as navigator on the submarine USS Nautilus (SS-168), which played a key role in the Battle of Midway. During the engagement, Benson manned the conning tower as the Attack Coordinator. Known affectionately to his crew as “Pigboat Benny,” Benson went on to command the submarine USS Trigger (SS-237) and won two Navy Crosses for valor, operating in enemy controlled waters in the Sea of Japan. Serving under him as a junior officer was Edward Beach, who went on to a storied career and eventually became the best-selling author of the classic submarine tale, Run Silent, Run Deep (1955). After the war, Benson married the former Vida Connole, widow of Commander David R. Connole who was the last commanding officer of Trigger, lost off Japan in March 1945, just months before the war’s end. Benson went on to a distinguished naval career, rising to Pacific Submarine Fleet Commander (COMSUBPAC), and later serving as Assistant Vice Chief of Naval Operations. He retired as a rear admiral in 1969. Roy Benson departed on eternal patrol from Washington, D.C., February 7, 1995, at the age of eighty-eight.